Back in October, you (hopefully) heard that over 6.5 million pounds of beef was being recalled due to a salmonella outbreak. While that was bad news, we've now got even worse news: That beef recall is nearly doubling in size. The US Department of Agriculture (USDA) warned on Tuesday that the Arizona-based JBS Tolleson, Inc. is now recalling approximately 12,093,271 pounds of beef. This includes "raw, non-intact beef items, including ground beef," packaged between July 26, 2018 and September 7, 2018. 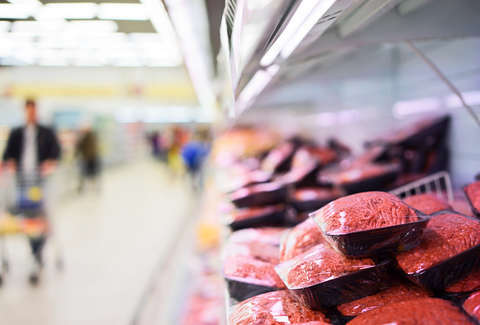 The beef has been linked to a nationwide salmonella outbreak that's reportedly caused 16 new sicknesses in addition to the 346 previously confirmed from a total of 26 states. The contaminated batch came from a JBS packaging facility that supplies products for Kroger, Cedar River Farms Natural Beef, ComNor Perfect Choice, Grass Run Farms Natural Beef, Showcase, Showcase/Walmart, Gourmet Burger, and JBS Generic, among others, Fox 5 reports. Recalled beef will read “EST. 267” inside the USDA mark of inspection. Salmonella can lead to symptoms like fever, abdominal cramps, and diarrhea, according to the USDA, and is particularly dangerous for adults, infants, and those with weakened immune systems. You do not want it in your life. At this point, it's unlikely that a store would still have any of these batches on its shelves, but there is a chance there's some sitting in your home. If you find that's the case, either dispose of it or take it back to the place of purchase.